We live in a risk society. On a never-ending search-and-destroy mission to eliminate sources of potential harm, we constantly develop new systems to identify it and mitigate it. But do risk-management systems make us safer? Or do they instead increase the very risks they are meant to eliminate? Questions about how Americans find, mitigate and create risks are apparent on a daily basis in the industrialized food system. Since 1993, when E. coli O157:H7 was found in Jack in the Box hamburgers, there has been a multi-state outbreak of food-borne illness nearly every year. From a 25 million pound recall of beef in 2002, to an outbreak linked to bagged spinach in 2006, from the 2009 discovery of Salmonella –laced peanut butter in 2009 to an outbreak of Listeria linked to chopped celery in 2010, it seems that the risk of contaminated food and the fear that goes with it have become inevitable in America’s industrialized food system. The food industry has treated bacteriological contamination as a technical problem, and has responded with new technologies to ensure food safety, including carcass washes, acid dips, and even radiation. Yet, the bacteria seem to constantly overflow the technological solutions meant to contain them. Why can’t the industry seem to control the spread of disease? Why can’t the federal government seem to make food safe? Is the public’s beef really only with beef, or do contemporary worries over microbiological pathogens like E. coli show deep public discomfort with more than just food? The problem is that because food-borne illness arises from a spatial ecology created by a highly consolidated food system, the microbes of disease exceed mere technological fixes. 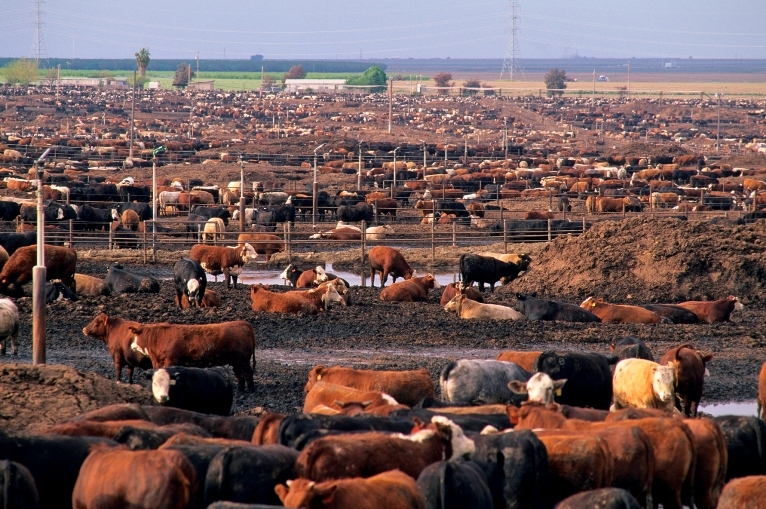 In the beef industry, for example, 85% of the US market is controlled by four companies that have established massive feedlots where thousands of cattle stand nose-to-tail in their own feces. These cattle are killed in high-speed slaughterhouses, where a single slip of a worker’s knife into the intestines of an animal carrying O157:H7 could contaminate the entire river of meat made by combining flesh from thousands of animals into a continuous flowing stream of ground beef. The USDA has responded to the problem of the material system of food production with an administrative system designed to mitigate risk. The Hazards Analysis of Critical Control Points (HACCP) system required meatpackers to analyze their production processes for potential risks, places where pathogens might be introduced, or steps where pathogens might be killed (e.g., a cooking step where the meat is raised to temperatures that destroy the bacteria). Then the packers were supposed to label these steps as “critical control points,” or CCPs, and establish “critical limits” for each of them. Under HACCP, USDA inspectors don’t test the meat at all—in fact, under the terms of the 5th Circuit Court decision in Supreme Beef vs. USDA, the USDA has no power to test beef for microbial contamination. Instead, USDA inspectors inspect the logs detailing the measurements of the CCPs. Audits are supposed to create trust in the food system by creating “transparency.” That is, they purport to have a one-to-one correspondence with what actually goes on in a firm, granting auditors (the USDA) and consumers the ability to look onto the kill floor and the production line and see what actually happens there. Modern power is thus based on more than the gaze, on more than the watchful eye, and on more than mere surveillance and punishment: it is based on the ability to purify, to remove excess, corruption and putrefaction from view and sweep it away. These audits seek to define specific, spatially delimited points in the production process where new technologies can be brought in to fix contamination. But because the problem comes from the economic structure of meatpacking and the large-scale spaces of food production it engenders, microbial contamination seems to constantly spill into new spaces even as HACCP seeks to eliminate it. Outbreak after outbreak forces firms and regulators to keep searching the production process to find “reservoirs of disease,” or places where microbes are lurking. Because they are forced by the HACCP system to find more and more “critical control points” where bacteria might be, packers have been finding more places where microbes can be identified and destroyed. Where once E. coli O157:H7 was only in the cows’ intestines, now it appeared to overflow that fragile membrane and to spill into noses pressed up to other cows’ rumps, onto hides, into water troughs that flowed among corrals, and into the trucks that brought animals from different herds together to transport them to the packing plant. It was found not just in the packing plant, but in the lairage outside it, at the feedyard, and on ranches—all spaces that USDA has no jurisdiction over. Clearly, E. coli’s ability to proliferate in space exceeds the state’s ability to control it. Just as E. coli is being seen now as overflowing the intestine, the container which bounds excrement, so too is E. coli and the excrement that bears it overflowing the audit system, the system the state claims is a sewer which could transmute excrement into numbers, contain disease, and carry away pathogenic waste. So, paradoxically, although the HACCP system is meant to create trust, what it really creates is anxiety. It reveals overflows of filth and zones of wildness, like the ranch, the trough, and the cow’s rump, where contamination is rampant. Like all audit systems premised on the detection of risk, HACCP impels the state not only to respond to external crises, but to continually seek out such crises in order to prove its own ability to provide security and to convince the population of the need for regulation. Risk in the food system is thus not just a continually expanding problem, but one created by the very system meant to contain it.